A modern, Mediterranean take on Scottish ingredients, served in an informal restaurant-bar alongside sustainably sourced natural wines. From the colourful sign above the door to the bright orange bar, there’s a playful, laid-back feel at this much-lauded Finnieston spot. There’s seating at the bar, tables up and downstairs, and a mezzanine level overlooking the largely female team of chefs cooking away in the open kitchen. Dishes are stripped down to a handful of ingredients, and hyper focused on quality Scottish ingredients. The menu spans the Mediterranean, with a sprinkling of Middle Eastern touches. There’s a changing selection of small dishes, organised through from snacks to veg, fish, meat and sweet. 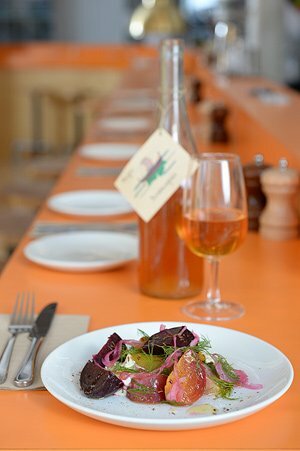 Try a salad of beetroot, blood orange, chicory and pickled onions – a dish of sharpened simplicity that sees each ingredient sing in tune with the other. For fish – order octopus with ajo blanco and grape, or a clever little sea bass ceviche with orange and chilli. Lamb chops with fava beans and harissa is a plate emblematic of the kitchen’s minimalist, refined style. Wines, meanwhile, are natural, funky and fresh: from small producers adhering to principles of minimal intervention in the vineyard and cellar.